1 Thessalonians 2:4 - For we speak as messengers approved by God to be entrusted with the Good News. Our purpose is to please God, not people. He alone examines the motives of our hearts. It took me 44 years, but I've finally done it. I’m cool. I always wanted to be cool. When I was a kid, I used to watch the TV show “Happy Days” and idolize the character Arthur Fonzarelli (AKA Fonzie or the Fonz). I was only five or six-years-old, but I wanted to be like the Fonz. Fonzie was the epitome of cool. Looking back now, it seems silly. He had greasy hair, wore a white undershirt and a black leather jacket, and his “office” was in the men’s bathroom of Arnold’s Diner. How in the world would anyone in real life think that was cool? But somehow Fonzie was cool. He could start the jukebox with the bang of his fist and snap his fingers and two beautiful girls would magically appear beside him. 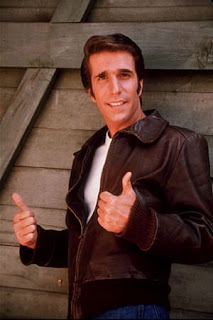 I wanted to be cool like Fonzie my whole life. In high school, my friends and I tried to be cool. We dressed the way we thought cool people should dress and tried to hang out with the cool crowd. But deep inside, I knew we weren't cool. I’ve never had fashion sense; I’m socially awkward and shy. Cool didn’t working for me. I needed a new plan. Maybe it took parenting teenage children to make me cool. It’s enlightening to listen to teenagers talk about cool fashions and say things like, “You're too old to wear those shoes.” And it’s revealing to see some ridiculous fashions from yesteryear suddenly become cool again. Last year, my family harassed me for being a lame dad who wore Crocs with socks. Last week, I was in a trendy restaurant and the fashionable waiter was wearing Crocs with white socks. I pointed it out to my wife and she said, “Yeah. It’s the cool style now.” Really? Who decides this stuff? So I guess I've just reached a point in my life where I really don't care what people think about me. I care about the people, but not about their opinion of me. I care what God thinks; I think it’s cool to walk with Him and seek His will for my life. Now I'm not saying I don't care about people’s advice. I want to be the best person I can be and sometimes feedback helps me be a better father, husband, pastor, or friend. However, I'm not trying to make anyone think I'm cool.